People sit outside at a fabulous restaurant and enjoy the night life along the Rue Saint Denis in Montreal, Quebec in Canada. The night life along the Rue Saint Denis in Montreal, Quebec is full of excitement while many people visiting enjoy the evening air as they sit on the outside terrace of a restaurant. The signs along the street are all brightly lit at night and many visitors to the area like to stroll along the Rue Saint Denis and take in the sights. Nightlife and Restaurants lining Rue Saint Denis, city of Montreal, Quebec, Canada. 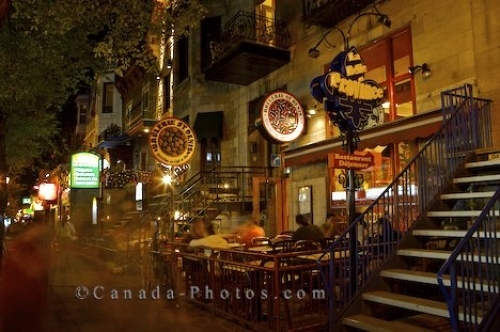 Photo of people enjoying a meal at a restaurant and life at night along the Rue Saint Denis in Montreal, Quebec.